IT disaster recovery and business continuity strategies have generally been fairly segmented from one another in the past. Business continuity plans would often focus on key issues such as employee safety, keeping certain mission-critical systems running regardless of a disaster, and preventing downtimes from having an adverse impact on the organization. Disaster recovery, on the other hand, focuses on responding to an incident that causes an outage or data loss event. Cloud computing, and the rise of Disaster-Recovery-as-a-Service solutions, is beginning to bridge the gap between these issues. CIO reported that the shifting consumer and regulatory pressures put on companies are making downtime and outages particularly damaging, forcing companies to put more resources into mitigating a disaster and maintaining business continuity. ZDNet explained that cloud computing is emerging as the avenue to improvements in these areas, allowing companies to rapidly switch over to backup instances without losing data with almost no downtime. Historically, businesses have only been able to duplicate small portions of their configuration in multiple facilities. In theory, having redundant servers, storage machines, and network setups in two data centers allows one system to act as primary and the other as backup. The setups are synchronized and should something go wrong, IT can failover to the backup systems. The problem is that businesses had to have multiple data centers fully linked by a high-performance network and double the storage and compute resources it actually needed. In practice, most companies could only afford to synchronize their mission-critical systems, limiting the reach of business continuity efforts. DRaaS allows organizations to establish a more cost-efficient backup environment, allowing organizations to make more of its systems available as failover options. As a result, companies can maintain continuity for a larger number of processes when a disaster strikes by switching over to the DRaaS setup. Natural disasters, power outages, and system failures have long dominated the IT disaster recovery space. Cybersecurity issues have been largely left in the backburner, but emerging attack types are changing the conversation. Most disaster recovery plans focus on preventing data loss. Conversely, the majority of cyberattacks emphasize stealing data, not making it inaccessible to the business is changing. With the rise of ransomware and distributed denial of service attacks launched through internet of things (IOT) devices, cybercriminals are preventing organizations from accessing their own data, effectively creating a data loss event and impacting business continuity. Companies can't necessarily divide their recovery and continuity strategies, as the tactics must work together to minimize damages. Because DRaaS offers a segregated backup configuration, systems won't be impacted by an attack and organizations can often switch to the background environment if they are facing an emergency. Many downtime events are caused by isolated issues. For example, a power outage may bring your offices down, but the surrounding area still has power. In situations like this, businesses can rely on cloud service providers to offer data, application, and infrastructure accessibility through the internet, ensuring users can simply travel to an alternate location - assuming travel is safe - and keep on working. 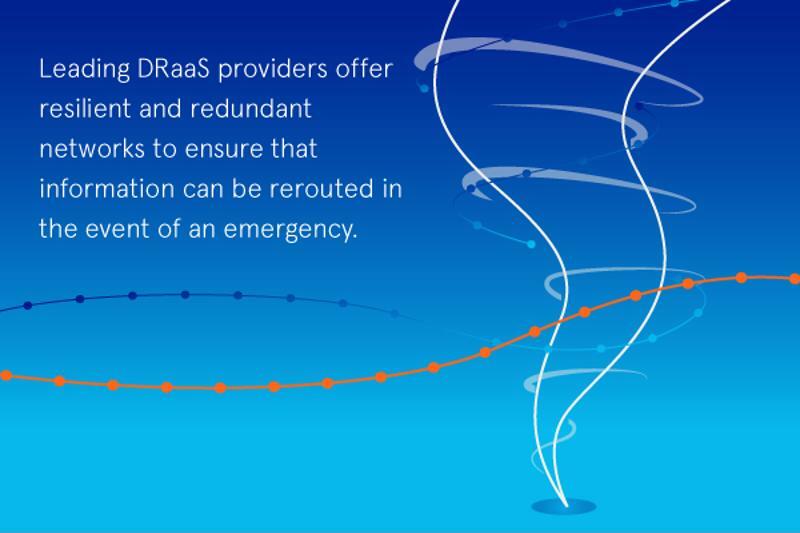 What's more, leading DRaaS providers offer resilient and redundant networks to ensure that, in the event of a disaster in any region, systems will either remain available or information can be rerouted to ensure organizations can keep everything running. DRaaS is poised to be an integral component of enterprise technology. DRaaS takes many of the features that existed exclusively in the most powerful, expensive disaster recovery strategies and makes them accessible and cost effective. As a result, organizations can better align their disaster recovery and business continuity strategies to both prevent and minimize downtime. As organizations become more dependent on IT operations to stay competitive, it isn't enough to simply recover quickly after an outage. Businesses must be resilient and responsive. DRaaS makes that possible. At Fusion, our comprehensive DRaaS solution model is backed by an extensive high-performance network that is monitored 24/7 and features full redundancy. Furthermore, our long history of serving the communications industry has prepared us for an operational climate where downtime is unacceptable, and we've built our enterprise-class solutions accordingly.